Nigeria is suddenly on everyones radar. Over the past couple of weeks we have seen the Shell Sorry campaign launched in The Hague; the BBC2 drama Blood and Oil set in the Niger Delta; the Channel 4 Unreported World documentary on the aftermath of the Jos violence; and now another documentary on the ingenuity of Lagoss poor to earn a living on the streets of this megacity of 14 million: Welcome to Lagos. (BBC2 15, 22 and 29 April]. 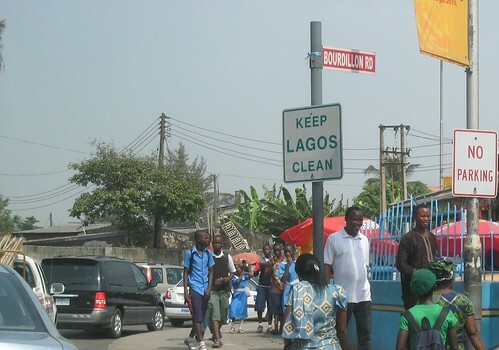 In truth, no-one knows how many people live in Lagos, or any other megacity for that matter. I am trying to feel positive about this film and happy to see the focus on Lagos entrepreneurship. Every city has its own uniqueness, its own culture, vibe and market. But I dont think the poor of Lagos are any different from those in other cities. Poverty requires inventiveness if you are to survive and with the overconsumption and waste of the rich there is always a market, however small. But still there is something very special about the mega market city of Lagos. One of the things I love about Lagos, and Nigeria in general, is the presence of a seemingly neverending 24/7 market. Everyone is on the some kind of hustle, whether to sell you a service or a product. There is nothing better to take away the sting of Lagos traffic than to spend your time buying groundnuts, oranges, airtime, water, toilet paper or sausage rolls and knowing that if your car overheats someone will be there in a minute offering to fix it. What is normal  how do we measure normality and why would poor people be less normal than anyone else? Are the rich, the middle classes, normal? What does he expect poor people to do? Its disingenuous to imagine that because people are poor they are not capable of organizing and policing their communities. The Harvard architect Rem Koolhaas documentary Lagos / Koolhaas, which I recently saw in Lagos, is similar in its bewilderment of how the city manages itself and people negotiate their daily lives. A problem with many Westerners who visit Africa is they are so used to their own form of order  which is often extremely boring in its predictability  that they lack the imagination to see beyond the apparent chaos. Buses parked haphazardly without any obvious sign of where they are headed may appear chaotic compared to neatly lined-up buses in the bus park with visible signs of the destination. But there is a method: its just that the foreigners dont know what it is! Years later, in another restaurant in downtown Los Angeles, over dinner in Little Tokyo, Gaby Jauregui tells me how much the Lagos I write about in my novel GraceLand makes her yearn for her Mexico City. In that moment I realize how much cities are not just geographical locations but psychic spaces of existential melancholy and desire. That we are always listening to the city inside us: Lagos-London-Istanbul-Los Angeles-Mexico City. There is only one city in the world and I guess Italo Calvino is right: it is an invisible city. And yet these invisible cities of the melancholic soul are geographical places of real joy, of concrete despair and of inventiveness that people who live away from the urban will never fully understand. What Rem Koolhaas, and I suspect Will Anderson, (I reserve the right to change my mind when I see the film) do in their films is, they miss the underbelly of Lagos  the Lagos of Abanis Graceland. The short quote below captures some of the cruelty and inequality that exists in Lagos and other cities where the rich and poor rub each other to rawness yet, at the same time, are as distant from each other as Lagos is from Amsterdam. Somewhere in another Lagos slum, a child is peeping through a crack in the wooden wall of a shack built on stilts in a swamp. In the distance, a line of skyscrapers rise like the uneven heart of prayer. In the shadow of highrises, behind the international money of Broad Street, the real Lagos spreads out like a mat of rusting rooftops. For Esther, 24, life does go on very well. She lives in a shack house built on Kuramo Beach, a tiny spit of sand attached to Victoria Island, Lagoss most up market neighbourhood. You cannot imagine the heat and humidity in that small house. The mosquitoes and sandflies sent to drive you crazy! She has just finished reading The Girl with the Dragon Tattoo; she watches Nollywood movies and she supports Chelsea! Well each on to her own; at least she hates the Red Devils!